So, what’s your favorite physical game? Sorry, for the lame question! Obviously, it has to be soccer, otherwise, you wouldn’t be here. What? Is it something else? Then please let us know. Well, for now, all we can say is most of us love playing soccer games like FIFA or PES on our PC/Console but the problem arises when we prefer to play something similar, on our tablet/smartphone while on the go. Why? Because the list seems to be pretty confusing when you search for soccer games on the PlayStore. 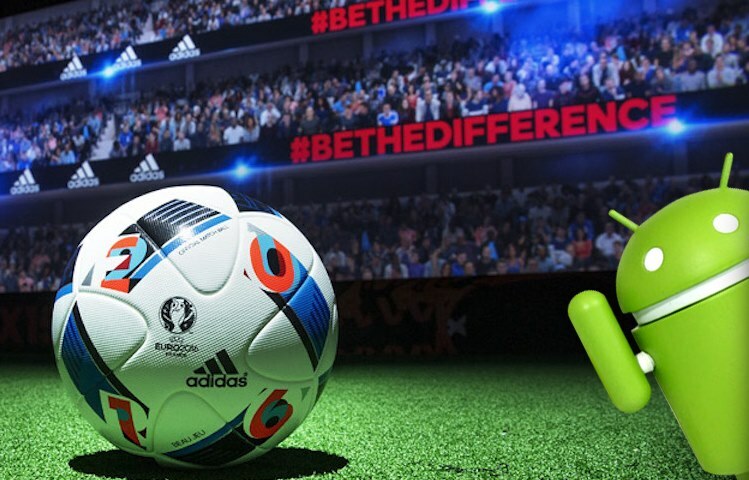 Hence, especially to solve your predicament, we present a list of best soccer games for Android which you may like. If you feel like adding some games to this list, then please be happy to inform us. The Liga BBVA exclusive app has all the official stadiums, teams and respective players from the league itself. Hence, imagine what it would be like playing as a biggie Ronaldo! You do get the privilege to enhance the abilities of your players and unlock various special shots. The eye-candy game features different gaming modes ranging from Cup to League Seasonal. Want to create your own big head player? The Editor mode is at your service. This application is free to download but there may be some in-app purchases you need to worry about later. If the game gets a multiplayer feature, then it would definitely be more fun to play. Head Soccer La Liga 2016 is one among the best soccer games that you will find for Android. Do you frequently watch dreams of becoming a star footballer? Then Score! Hero is your atta-boy. It’s a very simple and exciting game that offers a career mode for your would-be-legend. The application has been well optimized to deliver a story-based experience for your legendary player-in-making. There is a replay feature too which enables you to correct a failed goal attempt. However, it’s a limited feature and might require some in-app purchases if you happen to use it frequently. The game’s available for free. Care to try something more casual and a lot cooler? 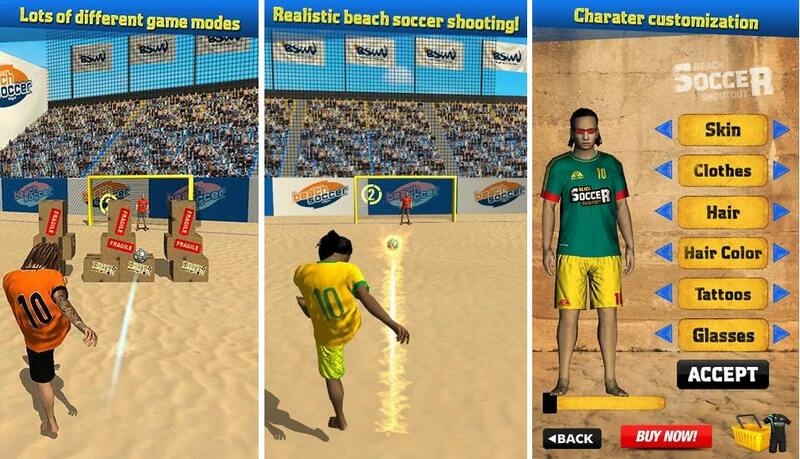 Well then, to be frank, Beach Soccer Shootout is a football game that you should definitely try. So, soccer on the beach, eh? Sounds interesting! Earn cash in different game modes, build your avatar and get a funky look. Ranging from arcade to multiplayer, Beach Soccer is a good social game as well. Remember that your scores get reflected in the leaderboard. You can download the game from PlayStore without even spending a penny. In short, this mobile game is just the Ultimate Team rip off from its PC/Console version. In terms of features, gameplay, and visuals, FIFA 16 Ultimate Team is probably the best soccer game in PlayStore so far. Build your ultimate team, buy/trade players, customize your play-style, change your formation and manage your team chemistry to get the best performance out of your players. You can also simulate matches and switch to manager mode to optimize your outcomes on the basis of strategies and tactics you implement. Built on Frostbite Engine, the game is equipped with top-notch AI, accurate precision, fluid dynamics, and controls. However, FIFA 16 is available for selected devices only and requires highly stable, fast and good internet connectivity. However, FIFA 16 is available for selected devices only and requires highly stable, fast and good internet connectivity. Well, that’s not it because randomly in another round you might end up guns blazing! Stupid Soccer is very funny and highly unpredictable. 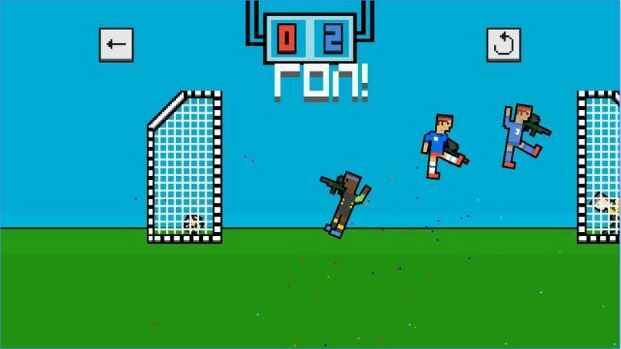 If you want to switch back to 8-bit soccer, then this might be the perfect game for you. It’s free to play. If you want to capture/record unique moments within the game then the unique replay feature is there at your service. But you might want to edit the team as well as league names initially, as they haven’t been licensed. Putting those limitations aside it’s one among the best soccer games in the PlayStore in terms of compactness, features, and eye-candy gameplay. Putting those limitations aside it’s one among the best soccer games in the PlayStore in terms of compactness, features, and eye-candy gameplay. Table football or pocket football as it seems, Soccer Stars is a turn based strategy football game that you can play online against various opponents or offline against the AI. You get to choose any national or club football team, and it’s another effective time cracking game as well. As you earn points, you get to invest them in unlocking various competitions/cups, team formations, etc. You can even share your scores on various social media like Facebook and Twitter as well. So, what are you waiting for? Download this from PlayStore as soon as you can. 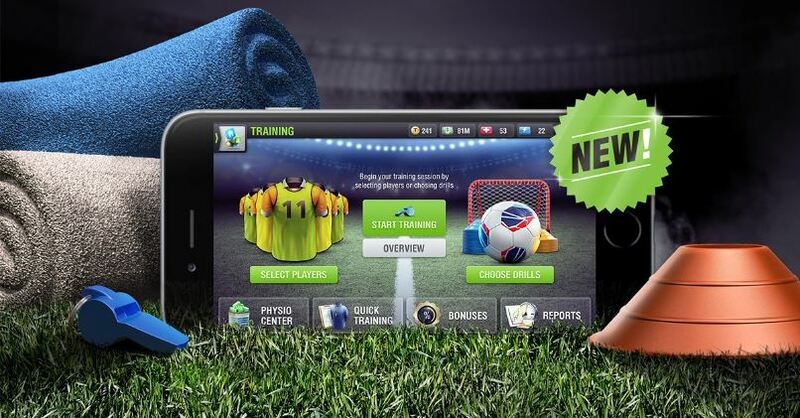 With more than 100 million registered users, Top Eleven is the most popular football manager game in PlayStore. This game really tests your management skills in guiding a team to success and glory. As interesting as it seems, you will be packed with loads of responsibilities as soon as you sign in as the manager of a team. Competing against other managers across the globe may prove to be tough and hence, in order to get better results you have to train and improve the skills of your players. Loan transfer and bidding play a crucial role in building the foundation of your team, and hence with fixed amount of resources it might prove to be a nut-cracking job in choosing the right players. Furthermore, as a manager, it’s also your responsibility to build, enhance, and maintain a stadium for your team. Most of us fancy stick-figure animations. In fact stick-fighting games really are very addictive and hilarious. But can we find the same in football? Yes, of course! 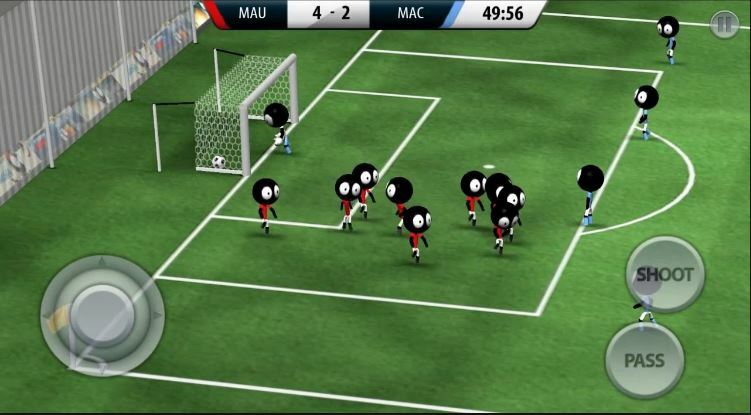 All thanks to Stickman Soccer 2016 you can enjoy a unique, funny and a relaxing experience. Well, just those stick figures won’t be enough to satisfy your football hunger! 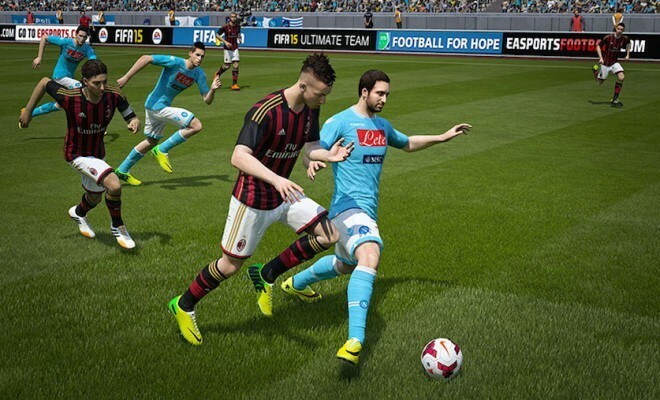 Hence, the game gives you the privilege to play various leagues and cup modes with more than 100 teams to choose from. You would be surprised to know about the game offering Women League and teams as well. Even, the game allows you to play locally with as much as 4 friends. The Party Mode enables you to play with your friends one by one on a single device. This is a game that very much deserves to be one among the best soccer games for mobile platform. If you want a game that works offline, that lets you create a stadium for your dream team which you both manage and play with real-time, then Dream League Soccer 2016 is the only answer for you. In short, it’s the ultimate football game to solve all your needs. Be happy that Dream League Online is there at your service too that enables you to compete with other dream teams across the globe. 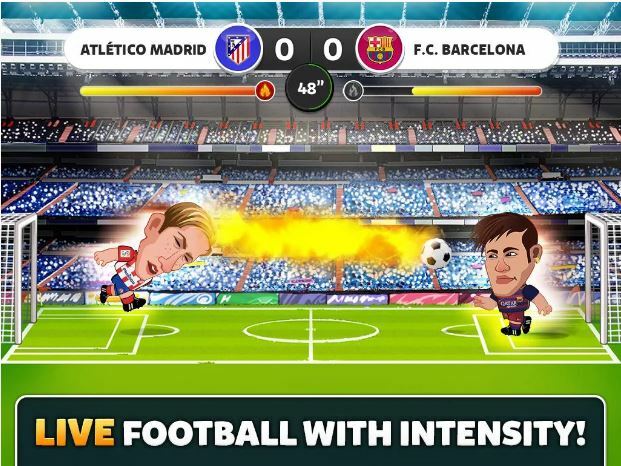 Hence, we consider this as the one among the best soccer games @PlayStore. So, are you ready to drive your team to the top across the 6 Elite Leagues? 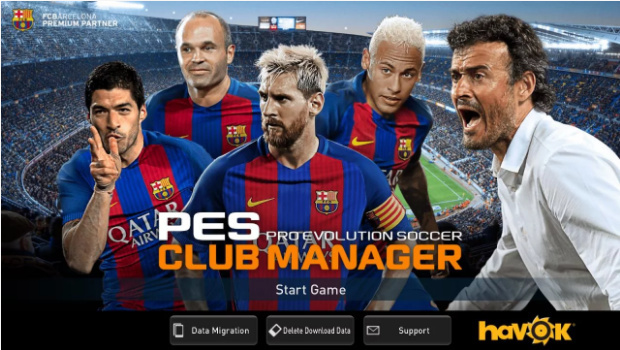 With more than 18 million players around the globe at present, PES Club Manager is one among the best football games for Android. 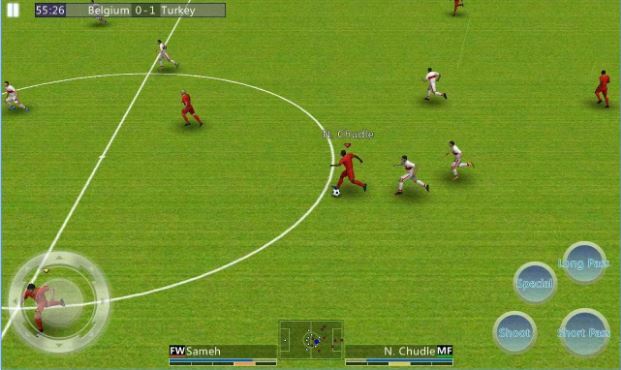 Developed by Konami, the game is a tough competitor for “Top Eleven”, the one that we mentioned earlier. 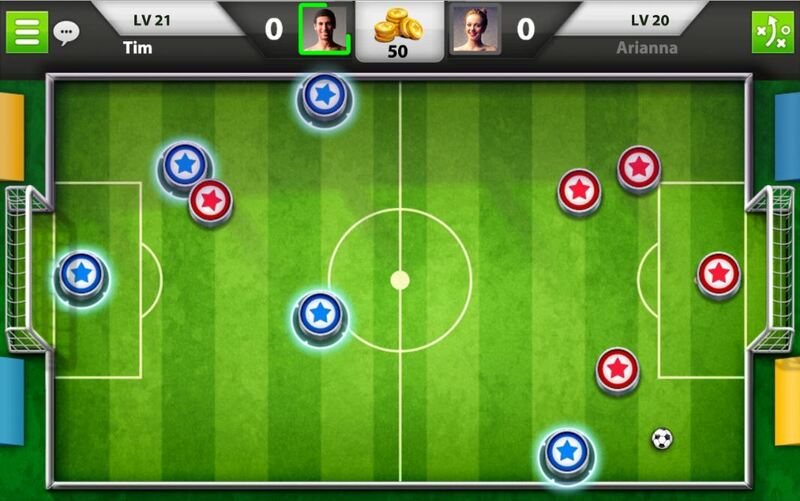 It’s rather a combination of Dream League Soccer and Top Eleven. In other words, you get to manage, coach and play live with your dream team. The enemy AI is very smart and reacts according to the scenario and pace set by you. There are more than 38 training sessions available to elevate your basics. Just like the actual game, you get to compete online in its mobile version too. Hence, trade players and manage your team accordingly to reach to the top in the online leagues. PES Club Manager offers match commentaries in more than 9 languages, which is rare to see in any Android soccer game. Love free-kicks? Well, that’s a dumb question to ask a soccer fan! Obviously, you do and you will definitely be hooked to Flick Shoot, which is a game that’s completely based on free-kicks. With more than six different modes, the game also features online matches against real-time opponents. You can customize your player, balls, jerseys and shoes too. Flick Shoot 2 is available to play in 8 different languages. 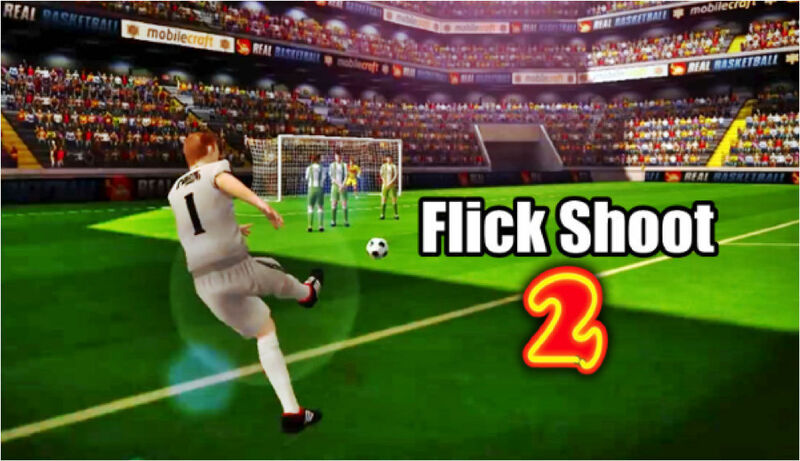 Indubitably, Flick Shoot 2 is one among the best football games for Android. 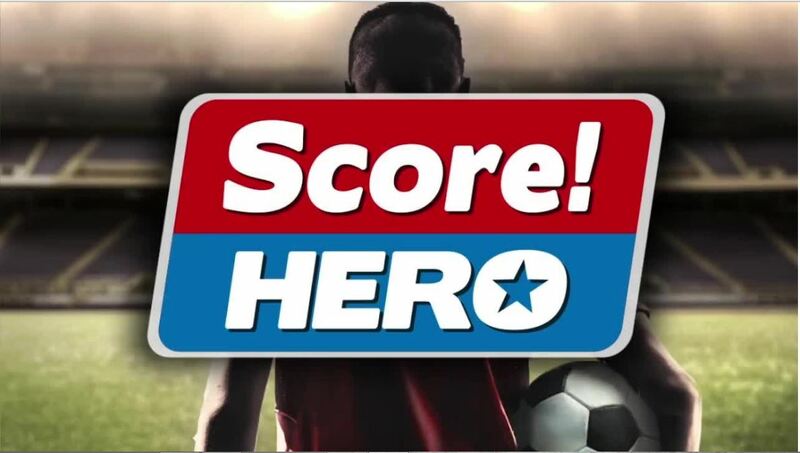 Hope, you were satisfied with our list of best soccer games for Android. Please feel free to inform us if you want us to add any more soccer games. How To Fix SSL Connection Error On Chrome? Previous articleHow To Fix SSL Connection Error On Google Chrome? I think Football Manager Mobile should also be on that list. Thanks for your opinion. We’ll consider about adding this to the list as well. Thanks for your suggestion. We’ll consider adding the game to the list. all football managers are the same besides underworld football manager, i think it is a must for this list. WHERE’S FIRST TOUCH SOCCER 2015??!! Man that’s way better than DLS 2016. The fluid gameplay, the graphics, the mechanic everything is fantastic!! Where can it be download? Thanks a lot for sharing this collection of best soccer games. I really appreciate your good work boy. I think the best football management game is Virtuafoot Manager. It’s more realistic than Top Eleven.